A commodity is a good for which there is demand, but which is supplied without qualitative differentiation across a market. There are generally two types of commodities, ‘hard commodities’ and ‘soft commodities’. Hard commodities comprise minerals which have a long shelf-life, while soft commodities constitute agricultural products that have comparatively shorter shelf-lives. Escalating commodity prices are hurting people in every corner of the world. In the UK, we are now paying the same money for reduced quantities and sizes. In Uganda, people recently demonstrated against the ‘heat’ caused by soaring prices. Food prices are now rising by up to 10% a year in Europe. The UN estimates prices to increase to at least 40% in the next decade. The prices of most commodities reached historic highs in nominal terms in 2008 before slumping to the credit-crunch. However, global commodity prices have been rising again particularly since mid-2010. Increased demand from fast growing emerging economies (China, India, etc) whose growing middle-class is changing dietary habits, including an increasing consumption of meat and dairy products. The substitution of (arable land) food crops for fuel production – a range of (land for) food crops are now being used in the production of bio-fuels in a number of countries in an attempt to reduce over-reliance on petroleum, and to reduce the carbon footprint. A decline in the growth rates of production and productivity, partly due to the adverse effects of climate change. Growing demand from emerging countries was also found to be responsible for the escalation of hard commodity prices, along with supply shortages caused by instabilities in some leading producing countries. However, there have been concerns that the above cited geo-political, economic, and natural factors alone aren’t sufficient to explain the scale of commodity price escalation. For example, over the past couple of years global crude oil production has increased along with increases in its demand. The US Department of Energy data suggests that during this period global supplies have in fact exceeded demand! That is why additional answers are now being sought elsewhere, including the commodity market. There are two types of commodity markets, spot and futures. In a spot market goods are sold for cash and delivered immediately. In a futures market, goods are bought for delivery on a specified future date. Only a relatively small deposit is required when committing to a futures contract. The rest of the money is paid close to, or upon delivery – in the future. Therefore, futures contracts can control a large amount of commodities with a relatively small amount of capital compared with spot contracts where all the cash is required upfront. In fact, it is estimated that the futures market currently accounts for 60-80% of the commodity market trade. The futures market traditionally comprised two types of players. On one side were market players (farmers/producers, processors, warehouse-men/storage-men) who had a real, physical stake in the commodity. On the other side was the speculator. A speculator doesn’t produce, process, store and handle, and often doesn’t necessarily consume a commodity. S(he) merely invests in the commodity simply to profit from the fluctuations of its value on the market – through the arbitrage of buying low and selling high. 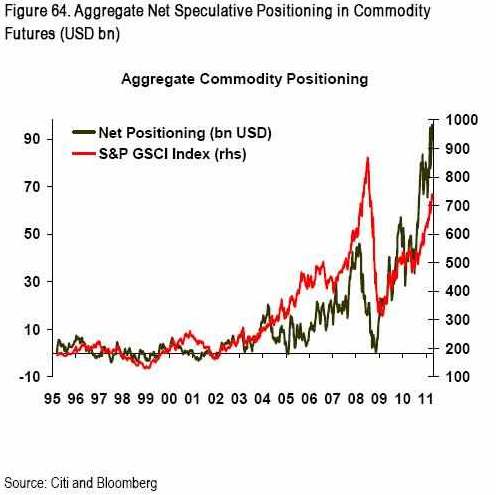 There has always been modest, even welcome, speculation in the commodity market – the speculators’ endless stream of buy and sell orders gives the market its liquidity and enables producers to ‘hedge’ (manage risk) by allowing them to sell and buy as they please. This is how speculation traditionally worked: Farmer X protected himself against climatic or other risks by ‘hedging’ – which is agreeing to sell his crop in advance of the harvest to Trader Y. This guaranteed farmer X a price, and allowed him to plan ahead and invest further. It also allowed Trader Y to profit. In a bad year, Farmer X got a good return but in a good year Trader Y benefited more. The tradition changed in the mid-1990s, when financial participants entered the market. Following heavy lobbying by banks, hedge funds and free market politicians in the US and UK, the regulations on commodity markets were steadily abolished. Consequently, parties who had no real physical stake in the commodities were enabled to participate in the commodity futures market. The futures market’s importance increased significantly since about 2004. It was catalysed further by the credit-crunch which forced banks and traders to move billions of dollars from pension funds and equities into relatively ‘safe’ commodities. Traditionally, commodity prices reflected the economic theory, which illustrates that there is always a market equilibrium price for a given level of supply and demand. When demand was high and supply low, the prices tended to increase, and vice-versa. Supply and demand forces meant that it was impossible to manipulate commodity prices. Yet, current evidence suggests the opposite – commodity supply is high, demand is high and prices are high, defying the traditional free market fundamentals! Speculators can drive commodity prices against the supply and demand market fundamentals. But, this is only possible if they either control the market, or if they are such a massive participant that their independent moves drive market prices. In fact, evidence points at the large global financial banks which for obvious reasons have access to large financial resources, as the key influencers of commodity prices in the futures market. They achieve this by bidding up the prices with purchases that are a significant percentage of the market – consequently, creating an artificial market where higher prices are accepted and paid. The large purchases of commodity futures contracts by these heavy handed market players have, in effect, created an additional artificial demand for commodities, driving up the price of commodities for future delivery in the same manner that additional demand for contracts for the delivery of a physical commodity today drives up the commodity price on the spot market. By purchasing large numbers of futures contracts, and thereby pushing up futures prices to even higher levels than current prices, the global financial banks have provided a financial incentive for commodity traders to buy even more commodities and store them – a kind of hoarding. A refiner will purchase extra oil today (on the spot market) and store it, if the futures price is higher than the spot price. As a result, over the past two years commodity inventories/stocks have been growing steadily. Because of the futures market, commodity prices are now not linked to supply and demand forces, but rather to traders reacting to information and speculating on the markets. Traditionally, if for instance news came about bad crops and rain somewhere, the price would rise by say $1 a bushel. However, because of the speculative market, the price may now go up by $2-3. In sum, the large influx of speculative investment into commodity futures spearheaded by leading global banks has led to a situation where we have high commodity supplies, high commodity demand, and high commodity prices. Unfortunately, it is becoming increasingly clear that the same banks, hedge funds and financiers whose speculation on the global money markets caused the credit-crunch are engineering this artificial commodity market. They are taking advantage of the deregulation of global commodity markets, and making billions from speculating on commodities, thereby causing world-wide misery to producers and consumers. To add insult to injury, commodity prices are now determined by a process so opaque that only a handful of the major players such as Goldman Sachs or Morgan Stanley have any idea who is buying and who selling the commodity futures that set physical commodity prices – perfect market information is held by only the mighty few! Evidently, the same banks responsible for the credit-crunch are also the ones effectively controlling the commodity market! It is very annoying to learn that people are suffering around the world just because sycophants are stocking commodities – this reality of CAPITALISM is scandalous. Cut down taxes levies on certain basic necessity imports (foods, medicines, etc), and on those commodities such as oil, which directly or indirectly significantly impact on the livelihood of the ordinary people. ¨ Recover the lost revenue by increasing taxes on luxury goods. Discourage exports of food crops except when there is significant excess capacity. This could involve measures to crack down smuggling. Governments could even go an extra mile by devising strategies of storing the excess supply. Encourage local consumption. If certain individuals sell their produce for substance existence, encourage the middlemen to sell them locally – i.e. to institutions, even if it involves providing some form of incentives to do so. Trade locally with neighbouring countries. Engage into bilateral agreements which involve controlled intra-country trade in commodities, thereby over-lapping the official commodity market. Scrape the colonial legacy of exporting raw materials at throw away prices, which are then processed in developed countries and resold to developing countries at a multiple price. The technologies required for processing are now standardised, widely available and affordable. ¨ For instance, instead of exporting iron or copper ore, add value and produce steel bars, copper pipes, and copper wire. Consume the processed commodities locally, and export (import) only when there is a genuine significant surplus (shortage). Avoid involvement in the international commodity market as much as it is practically possible. Developing countries should get together, form a joint body and lobby the developed countries to look into the speculative activities of their global banks in the commodity markets – this is the right time to advocate for an international corporate social and ethical responsibility code for global players. “The same financial firms that drove us into a global recession by inflating the real estate bubble through risky financial manoeuvres are now doing the same with the world’s food supply,” the report said. Hedge funds are behind “land grabs” in Africa to boost their profits in the food and biofuel sectors, a US think-tank says. These reports, as well as briefs on other aspects of land grabs, are available at http://media.oaklandinstitute.org. The Oakland Institute is an independent policy think tank whose mission is to increase public participation and promote fair debate on critical social, economic, and environmental issues (http://www.oaklandinstitute.org). Worldcrops has said that the most serious supply-demand tightness of agricommodities will be felt in corn, with a stocks-to-use ratio by the end of August 2012 now put at 5.3%. World food insecurity report 2011 – expect more of the same.